Any of the varieties of eggplant that are referred to as Chinese, Japanese, or Thai. The Asian eggplants, which are typically sweeter in flavor, vary more in shape and color than the American eggplants. The Asian varieties are generally long and slender or round and ball-shaped. Chinese and Japanese eggplants range in size from 3 to 10 inches. The Chinese varieties are generally white to lavender in color while the Japanese are light purple to a dark purplish black. 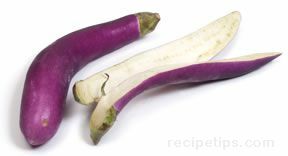 The ball-shaped Thai eggplants range in size from a half inch to several inches in diameter, with a flesh that is colored white to lavender. Most Asian eggplants are smaller in size than the American varieties. They do not last for long periods of time after being harvested, becoming more bitter tasting as they age.